The tale starts when I was contacted by a reader, Don Cathie, who believed he had some pictures I might find useful, they were thought to have been taken by his Grandfather John Davidson around 1900. It seems the photographs along with the viewer, pictured above, had reached the point of being unceremoniously sent to the tip, the collection having been stored away in a cupboard for some years, was re-discovered during a spring cleaning exercise , in a toy box used as a source of amusement for children on wet days! However the internet search proved successful as Don recognised that the pictures and the website he had found were both on the same subject. So after all the years of just being pictures from a long dead relative, they suddenly had a context. Like all good mysteries, the discovery raised as many questions as it answered. How did they come into the possession of John Davidson? When were they taken? Where were they taken from? Just a few of the questions raised, if you read on you will follow the thread giving a possible explanation of how they came to be with Don Cathie’s family. Initially the collection of stereo photographs were believed to have been taken by John Davidson (1878-1951), or if not taken by him, then perhaps purchased by him. His lifespan suggested to me that he could have been a bidder at the auction of 1905 where a stereo viewer was amongst the sale items. Additional information that John had married in 1904 to a Harriet Florence Shelton (1868-1948) and that she was a Yorkshire woman from Doncaster, added to this theory. THe pictures that were received are shown below. 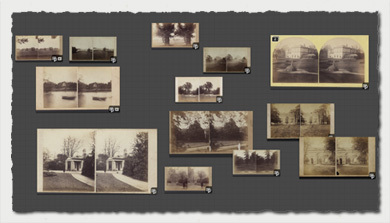 The following is a lightbox view of the stereo photographs of Parlington sent by Don Cathie, all the originals are the same size but have been highlighted on the lightbox by changing the scale to indicate their importance. There were 16 photographs in all, but some were duplicates, so I have ignored them for the purposes of this record. The three most significant, In order of importance, numero uno is the shot of the main entrance, the slide in the bottom left on the image above. Although it shows the entrance Porte Cochère , which is known to survive to this day in the gardens at Lotherton Hall, it was still a real treat to see it in-situ for the first time. The picture and 3D model from the earlier Hall Part Two page, is here. Craignish, I enquired How did you know! Exclaimed Don. Well that was the Scottish residence of the Gascoignes, I replied. It is just a guess. I was aghast, this was truly great fortune to come across not one set of historical photos but to discover there were yet more! We made arrangements for the remainder to be sent and to add icing to this cake, the viewer too! On receipt of the package some days later I could barely contain my excitement as I opened the parcel and unwrapped the contents, immediately testing the stereoviewer with the picture of the Hall from the first set, mentioned as number two above! It was like I was there, then, in eighteen... something or other, all in dramatic 3D. Sadly, to the readers here, you can only take my word for it as the technology does not work on a modern computer. Although I now understand there are ways of achieving a similar result by squinting at the screen! So you will have to wait until 3D electronic viewers are more readily available, I'll add the stereo images to the site then! The only drawback is that the subject needs to be still, as a few seconds elapse to take the two shots. Secondly the print being digital, at 300dpi, is slightly pixelated when viewed through the stereoviewer. A higher resolution dye-sublimation printer may be the answer, or alterantively a print to medium format film positive (2 x 6cm square) might work well. I was interested to read your pages on the stereoscopic photographs you so luckily located. I am a local photo-historian and former Hon Curator of the Stereoscopic Society. If it would be of any help I could confirm the date of the photographs if you were able to send me scans of a reasonable resolution. Naturally I was delighted to learn what John could contribute, we all gain by pooling our knowledge. You are quite right to place these as likely being taken in the 1860s although they could have been produced as late as 1870. Flat mounts, on white or yellow cardstock are typical of this period. As to whether they are of commercial production or taken by the family. They are clearly not published by one of the big commercial publishers, however many local Victorian studio photographers also offered to photograph homes of the local gentry and it would be quite possible these could have been taken through this route. They seem to have different origins using different cardstock and image size. Both however show the same error of cropping (this gets anorakish here). 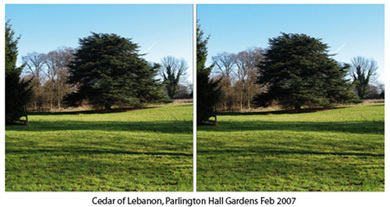 To achieve what is called a clear 'stereo window' you need to crop (trim) the photos so that the left hand image shows less of the left hand edge of the scene than the right hand image. When this is done the effect is of looking through a 'window' at the stereo scene. In both these photos the photographer has done exactly the opposite and the left hand picture shows more of the left hand side of the scene. This gives what we call a 'floating edge' which detracts from the stereo effect. However this mounting error is widespread in photos of this period so we cant put too much weight on this evidence. The titles on the backs could be in the same hand but that only tells us what you know already - that at some time these two cards were in the possession of the same person. I'm so fortunate, from time to time I receive encouraging responses such as this, it not only inspires me to investigate further but also reinforces my belief in the great benefits the Internet can and does offer to the advantage of all in society. Being a bit of a Techie I am grateful to learn how the crop assists the stereographic representation! 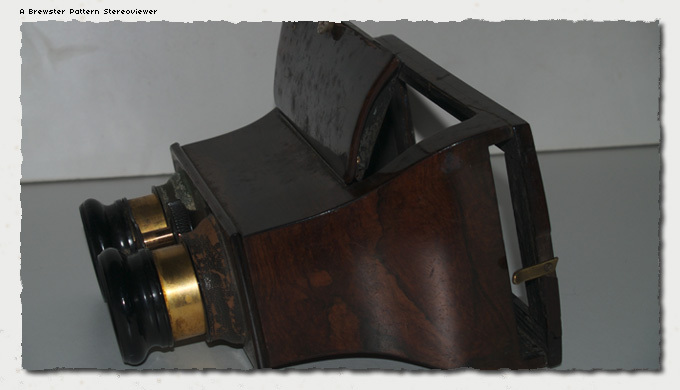 A Fellow of the Royal Society and founder of the British Association for the advancement of Science, invented the Stereoscope, a viewer for stereoscopic prints, in 1849. His invention was popular in Victorian society, many were to be found in the drawing rooms of the day. He wrote a book titled The Stereoscope, its history, theory and construction . The following extract by Robert Leggat from his site mentioned above: Stereoscopic, or 3D photography, works because it is able to recreate the illusion of depth. Human eyes are set about two-and-a-half inches apart, so each eye sees an image slightly differently. If one takes two separate photographs that same distance apart, with a suitable viewer it is possible to recreate that illusion of depth. This is a list of some external references I have found on the web which may add to the information contained here.